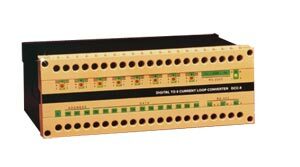 The DRA-DCC-8 is a microprocessor-based unit which converts digital data into eight continuous analog current loops. The processor controls the digital input, handles the active memory of the unit and updates the current outputs. For digital input range of 000 HEX to FFF HEX, the unit provides two user selected output current spans of either 4 to 20 mA or 0 to 20 mA. One parallel and two serial ports are available. The parallel input port receives an asynchronous 15 bit bus composed of a 3 bit output channel address and 12 bits of data representing the output current value. DRA-DCC-8 units can be connected in parallel to the input bus and selected by controlling the Enable (E) input terminal. The unit’s controller continuously scans the input data field and compares it to the previously stored data. When new data is encountered, the old data is replaced and the proper output current is updated. The DRA-DCC-8 provides both RS-232C and RS-422 full duplex serial communications ports. The RS-422 serial communications port enables use of up to eight DRA-DCC-8 units in a multi-drop configuration. A set of seven internal DIP switches enables parameters such as baud rate, unit identity code, digital input mode (parallel or serial) and output current span (4-20 mA or 0-20 mA) to be set by the user.